The Avro Vulcan was a massive subsonic delta-winged bomber that served with the British Royal Air Force (RAF). The first prototype flew in 1952, and the aircraft was in squadron service from 1956 to 1984 and carried out the Black Buck raids during the Falklands War. The aircraft was originally developed as part of the RAF's V-bomber nuclear deterrence force against the Soviet Union, during the early part of the Cold War. The aircraft also had a secondary role as a conventional bomber, being able to carry up to twenty-one 1,000 lb bombs (it also served for a period in a maritime radar reconnaissance role, and as a tanker - but not in either role during the Falklands War). By the time of the Falklands War, the Vulcan was preparing for retirement, its role as part of Britain's strategic nuclear deterrent role having long passed over to the Royal Navy's Polaris submarines. 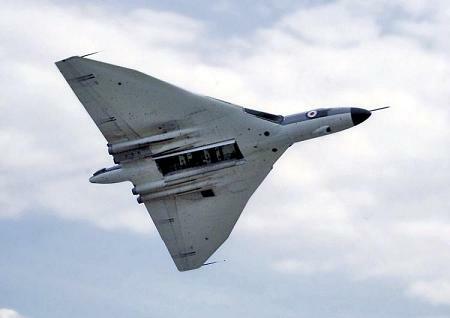 Nevertheless, despite its age, the Vulcan remained capable of delivering WE.177B freefall nuclear weapons, and continued to be available to support NATO ground forces in a tactical strike role. In preparation for the Black Buck raids, five Vulcans were selected. Because of their age, many modifications were necessary. The aircrafts' bomb bays were modified, the flight refuelling system (which had long been out of operation) was repaired, the electronics upgraded, and the capability of carrying an ECM pod and Shrike anti-radar missiles added. Vulcans were to carry out five raids (out seven that were planned) during the war, and bombed Port Stanley airfield, Argentine radar installations and Argentine ground forces. The raids on Stanley airfield, cratered the runway and forced the Argentines to withdraw their fast jets (including Mirage IIIs) back to the Argentine mainland. Each of the raids was flown from Wideawake airfield on Ascension Island over a a range of 3,380 nautical miles (6,300 kilometres), making them the longest range air combat mission then carried out. There is an excellent account of the first Black Buck, and the background to the missions, in the book, Vulcan 607.